An appeals court brief, amicus curiae brief, or other document prepared by the FederalCourt.Press is easy to spot amongst a pile of court filings. Our books have a precise and consistent typeset, with beautiful balance and spacing. When you pick up a book from Amazon or Barnes & Noble, and fan open the pages, you expect the typography to be consistent from page to page — the same fonts, margins, spacing, etc. — and most importantly the same “Look and Feel.” The Supreme Court has the same requirements. Akward White Spacing Gaps in the Text. Supreme Court documents use “justified margins,” meaning that both the left and right sides of each paragraph are in alignment. Because each line has a different number and combination of letters, word processors will insert extra spacing to get columns to align. However, this can lead to awkward and ugly white space that makes the text difficult to read. Over-Hyphenation. 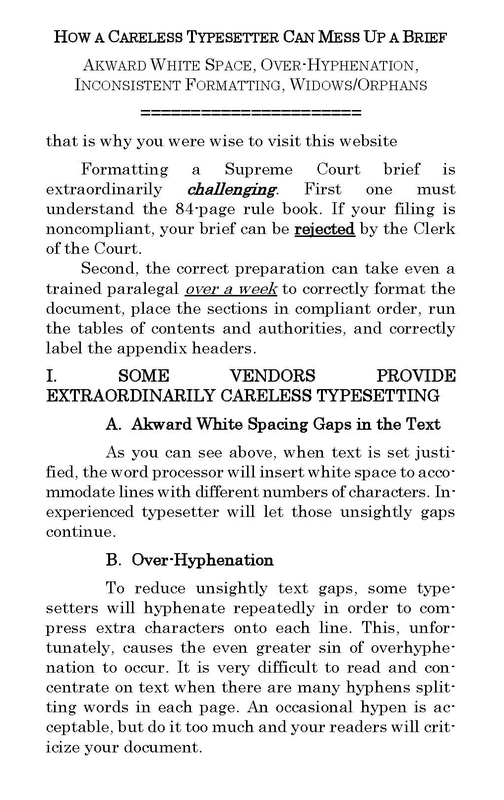 A solution to the problem of awkward white spacing is to allow the word-processor to hyphenate words to allow for more characters on each line, reducing the white space. However, this leads to an even greater problem than white space, which is over hyphenation. Each paragraph will have multiple hyphens in, sometimes with a hyphen on every other line. This makes the text unintelligible. Non-Centered Text Blocks.To get a document to work well on printing press, some printers will not center their text blocks. This is fine for the printed job, where the paper will be cut and bound. 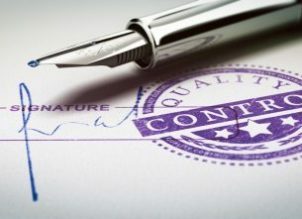 However, it is unacceptable on electronic filings with the text should be centered and read naturally. Hybrid/InconsistentFormatting. Formats can be wildly inconsistent. Line spacing can suddenly change. The font on the page number or the footnote will slip and change. There will be poor mixing and overuse of bold facing, italics, and underlining, as well as hybrid formatting where italics and underlines are all mixed together. Text Widows and Orphans. Section headers should not cut off and roll across multiple pages, which makes them difficult to read and remember. Individual lines should not be stranded without the rest of the paragraph for context.